Welcome to Parker County, my new stomping grounds. Number one thing to know about Parker County? It is all about peaches. Peach jelly. Peach ice cream. Peach cobbler. 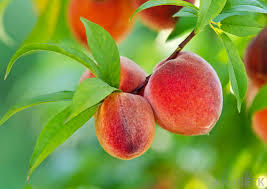 A peach festival. Peaches are celebrated, manipulated and integrated into everything. 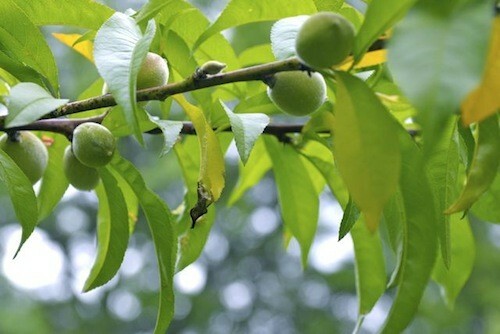 In my yard stands an established, beautiful peach tree that I cannot wait to pick peaches from this year! Since I am a novice at growing these sweet little fruits, the previous owners have passed down some one-liners of wisdom for the peaches’ care. My favorite? Keeping a nightly vigil over the innocent peaches in danger of being abducted? Listening to their other tidbits of advice, we trimmed back old branches and pruned the innermost parts of the tree to allow ample sunlight to grow the fruit. In the process of caring for the tree, a few small Peach Babies (obviously the technical term for under-ripe peaches) fell off the tree. Tiny and bright green, my daughter snatched one quickly. She treated it like treasure and refused to throw it away with the rest of the yard waste. Days went by and Baby Peach was brought in the house and cared for in the Barbie mansion, fed pretend cupcakes and even slept with, ’til one morning it was sitting on the kitchen table, looking less-than stellar. I have heard this Bible passage many times, but that day it rang differently. I MUST stay on the tree. That Baby Peach had all promise of becoming a beautiful, bright orange hue, with delicious taste and even softer touch, but falling away from the tree crushed all that possibility. Without the source of life, I am dangerously close to becoming that dried-up peach! My life needs to be connected to the tree if I am ever to flourish! That’s hard when my life is seemingly care-free at the moment. It has been smooth sailing since we moved into our new home, and it would be incredibly easy to continue to coast and not invite God into the picture every day. On our own, we become complacent and dis-engaged, forgetting to lean into God and letting Him lead us! When we are in the season of plenty, of happily growing, we can easily slack in our faith. There is something about success that tricks us into thinking we can do it all on our own. There is something about success that tricks us into thinking we can do it all on our own. So how can we keep watch during the harvest? How do we protect our faith when everything is good? How can we stay connected to our life source, no matter the season we are in? 1.) Take advantage of the sunlight. When the harvest has come and life is good, enjoy it! Soak it up and grow! Don’t get so wrapped up in the little annoyances that you miss all the good things God is doing. When the sun is shining and things are wonderful, thank Him for it. It will remind you of why you began your faith journey to begin with! 2.) Be very intentional with your time and commitments. Carve out time in your day, EVERY day, to read the Bible and pray. It takes effort on your part. It is not a magic trick or secret formula. It is just doing it. Sitting down, opening your Bible to any page, and reading. That’s it! If you show up, so will God. When God is trying to cut things out of your life that are not growing your fruit, hand him the hedge clippers. When you feel convicted about a show you watch or words you use, be obedient to let Him prune that out of your life. Let Him get rid of that selfishness, that judgmental attitude, that anger. 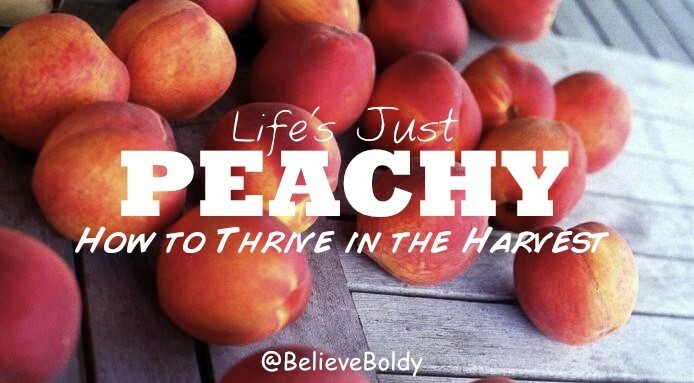 Stay on the tree and see God keep growing you into the Peach you were meant to be. You, too, can live the life God intended, in the good times and bad. Get ready to enjoy the harvest! Loved this – so simple yet so true! Erica, this was our theme at the Women’s conference that I went to back in February, ‘Abiding in Christ.’ Even in those peachy moments that I have, I still need to remind myself that apart from Jesus, I can do nothing. That is so true! When we don’t have to lean into God to solve a problem, we can easily become “self-sufficient.” It’s a daily battle, ya know? Erica, I love your blog!! I love the way you write and your pictures. It makes me happy!! You’re amazing! !